Located in a former automobile assembly plant in Chelsea, this apartment renovation maintains the integrity of the original concrete structure while transforming it into a livable, contemporary loft. A dialogue between the raw and the refined resonates throughout the space, where a new platform of walnut flooring and a pristine, floating ceiling plane are pulled back from the existing structure along the perimeters to reveal troughs of rugged concrete. The hovering ceiling plane serves a dual role by concealing utilities such as lighting, speakers, sprinklers, and ductwork. 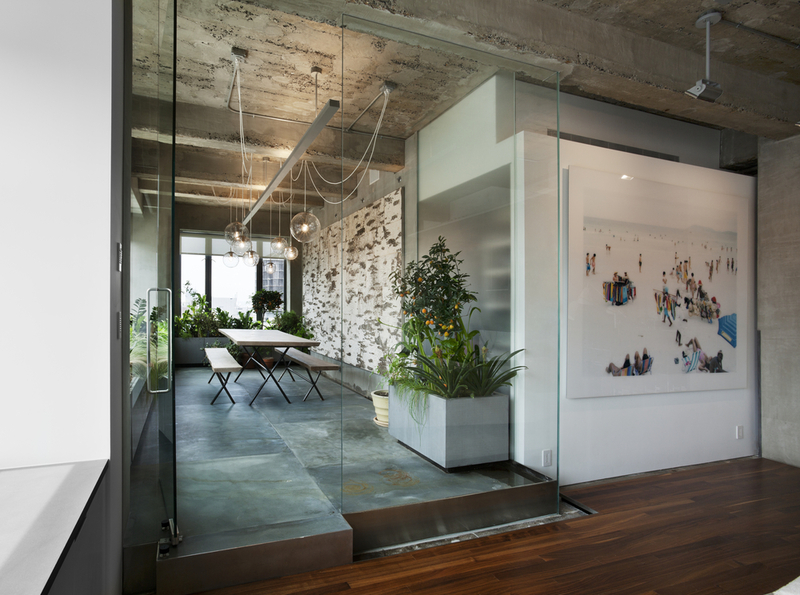 A light-filled garden room, enclosed by an interior glass partition, and the home office, separated from the apartment by sand-blasted sliding acrylic doors, create a sense of luminosity and openness that emanate throughout the entire loft.